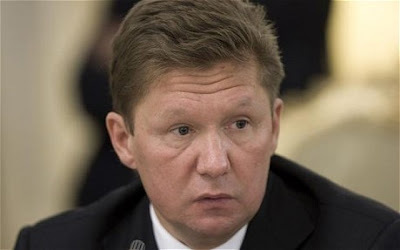 MOSCOW, Russia -- Russia insists on sticking to its current gas supply agreement with Ukraine, the head of Russian gas giant Gazprom Alexei Miller said on Wednesday, despite repeated calls for its review by Kiev, which considers the deal unfair. Gazprom CEO, Alexei Miller says Russia sticking to 2009 agreement. Gas disputes between Moscow and Kiev worry Gazprom's European consumers, because conflicts over pricing between the two have in the past disrupted Russian gas supplies to Europe, which are mostly sent via pipeline through Ukraine. After failing to get a price discount from Moscow in prolonged negotiations throughout 2011, Ukraine has sought to cut the volume of its imports of gas, which were set at 52 billion cubic metres (bcm) a year under a 2009 agreement. But Miller said on Wednesday that Gazprom was against cutting either the volume or the price of supplies. "We are working strictly in line with the contract, strictly in line with this volume," Miller told reporters after a Russian government delegation led by Prime Minister Dmitry Medvedev held talks with the Ukrainian government in Kiev. "We see no reasons to review the price," he added. Ukraine aims to reduce costly gas imports to 27 billion cubic metres this year and cut them further in the future by saving energy, switching to coal, increasing domestic gas production and diversifying its imports. In line with that plan, Ukrainian gas imports from Russia fell 49 percent year-on-year in January-May to 12.8 billion cubic metres (bcm). Ukraine imports about two-thirds of the gas it consumes from Russia at a price that has been rising steadily for the last few years. It has been paying $425 per 1,000 cubic metres in the second quarter, up from $416 in the previous quarter. Moscow has said it will cut the price for Ukraine only if Gazprom is allowed to buy into Ukrainian gas pipelines. Ukraine has so far refused to accept the trade-off. Monthly gas bills, which sometimes reach $1 billion have stretched the finances of Ukraine state energy company Naftogaz and the state in general, prompting them to borrow, sometimes from Gazprom itself. This month Gazprom agreed to make an advance payment of $2 billion to Naftogaz for gas transit so the company could afford to fill up its storage facilities, which help Russia meet peak European demand in winter. "If Ukraine needs more money to fill up underground storage facilities in order to live through the next winter without any issues, we will consider providing these additional funds," Miller said on Wednesday. Russia's refusal to cut the price and volume of gas supplies makes it harder for Ukraine to secure fresh funding from the International Monetary Fund, which wants the Kiev government to hike gas and heating prices for households. Ukraine heavily subsidises such supplies at a great cost, but eliminating the subsidies would be a politically risky move for the government.